My wife is missing, abducted by a stereotypically mad scientist. I search for her, wandering the corridors of a stereotypically spooky castle. Ahead, a gaggle of biomechanical zombies. No problem, I've been dealing with them all night. 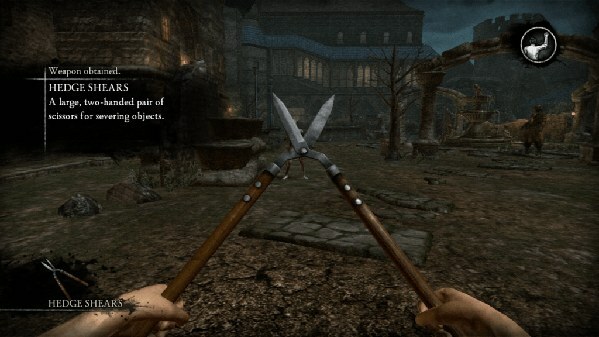 They're not invincible, and those garden shears over there look like the perfect solution to my current problem. I stretch out my right arm, picking up the shears. I raise them into an offensive position, turning instantly to my nearest foe. Snip. One down. Chop, shnikt, crunch. Three more dead in seconds. The abominations dispatched, I place my right foot forward, marching down the hallway. It curves to the left up ahead, so I twist my body appropriately to make the turn. With determination, I approach the corner and ... I run smack into a wall, fumble from side to side for a bit, step backwards, stop completely, reassess my position, turn my shoulders to the left, turn them back to the right because I overcompensated and, finally, continue on my way. I must have slain a hundred monsters in Rise of Nightmares, but they have nothing on my true nemesis: Walking. Players accompany Josh and his wife Kate as they travel the European countryside by train. As the story begins, the couple is having it out over Josh's boozing. Discovering a flask hidden in Josh's jacket, Kate storms off, leaving Josh (and the player) to pursue her. From this point on, players are in control of Josh's every movement via Kinect. Players have complete freedom, something that hasn't really been explored in Kinect games thus far. To walk forward, simply place a foot in front of your body. Twist your shoulders to turn left and right. It works well enough, though it's far from ideal. I never really felt like I was in complete control of Josh, who occasionally ran into walls and often veered to one side or the other instead of walking a straight line. Then again, Josh is a drunk, so I guess he would have trouble getting around. I don't know if Sega made this connection intentionally or if it's just a happy coincidence, but it helped my suspension of disbelief either way. While the movement is hit-and-miss, other physical interactions in Rise of Nightmares make great use of the Kinect, asking players to mimic real-life actions. Doors are opened with a simple push or, if you're feeling frisky, they can be kicked in. Cranks are turned, ladders are "climbed," and levers are pulled. One event sees Josh traversing a derailed train on the verge of tumbling over a waterfall. I crept over the surface of the train, forced to keep Josh's balance until it was time to just run. It's not like I've never leapt off of a falling train in a game before, but this is the first time I've actually had to run in order to do it. It was a genuinely thrilling moment, and a prime example of what Rise of Nightmares does best. Combat is handled intuitively, with a simple "put up your dukes" motion automatically focusing Josh on the nearest foe. Weapons behave as they would in real life. Machetes are swung, darts are thrown and giant power drills are plunged into anything foolish enough to get close. Combat seems overly simple at first, though Rise of Nightmares starts throwing a few curves later on. Some enemies, for example, have metal body parts that can't be damaged by most weapons. So, if a zombie's left arm is made of metal, you should adjust your swing to hit his right side or his head. In essence, aim for the squishy bits. Of course, if you happen across a pair of electrifying "shock knuckles" you can (and should) punch pretty much anything with reckless abandon. Boss fights are something of a mixed bag. For the most part, they aren't much more sophisticated than normal enemy encounters. Simply hack, slash, block and repeat. 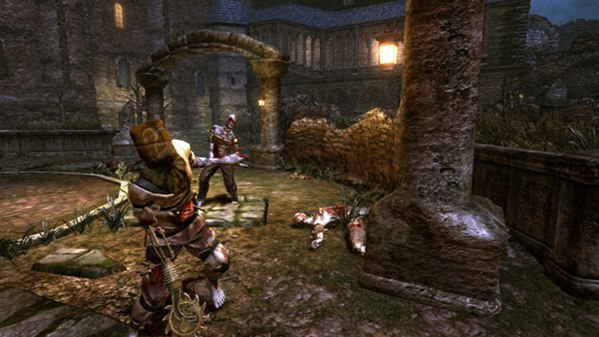 Battles occasionally require players to perform full-body quick-time events and, initially, they seem to add some extra challenge (and much needed mental involvement). That quickly fades, however, once you realize that most bosses only have one or two attacks that require QTEs, each of which calls for the same motion every single time. And, at some point, a few hours in, that's what Rise of Nightmares becomes: Just going through the motions between a few inspired physical interactions. The story is hackneyed at best and nonsensical at worst. During a climactic moment of the game, Josh must protect his wife Kate as they flee the demented castle. I was warned that Kate can't take too much damage, and so I spent the next few minutes slaying zombies and keeping her safe. During a cutscene a few minutes later, Josh just watched her wander away. After spending hours to save her, the baffling, illogical moment was infuriating. Honestly, if Rise of Nightmares wasn't a Kinect game, if it didn't offer up unique interactive ideas, such things would be nigh unforgivable. It's important to remember, however, that underneath the trite atmosphere and awful writing, there lies an experience that allows you to physically sift through a pile of skulls and, later on, toss explosive spheres of arcane energy at your enemies. As a concept, Rise of Nightmares has scads of potential. Properly applied, its mechanics could make for a grand adventure game, and I certainly hope that Sega keeps refining its approach (and that other developers are taking notes). As it stands, Rise of Nightmares is a noble, novel experiment, though it may not be an entirely successful one. This review is based on the retail version of Rise of Nightmares provided by Sega.